The U.S. Navy has taken possession of the shallow-water combat ship that will become the USS Little Rock once commissioned near year’s end. The $360 million ship will soon make its way from the Wisconsin shipyard where it was built through the Great Lakes to Buffalo, N.Y., where it will be formally inducted into the naval fleet near the convergence of the Buffalo River and Lake Erie on Dec. 16, a Navy spokesman said. The future USS Little Rock will be the second Navy ship christened after Arkansas’ capital city. The first — a Cleveland-class light cruiser put into service in 1945 before transforming into a guided missile cruiser a decade later — is now a museum in Buffalo. The December ceremony will be the first time in the Navy’s history that a ship has been commissioned beside its namesake. Ron Maxwell, coordinator for the USS Little Rock Namesake Committee, said the commissioning will be historic for both the Navy and Little Rock. 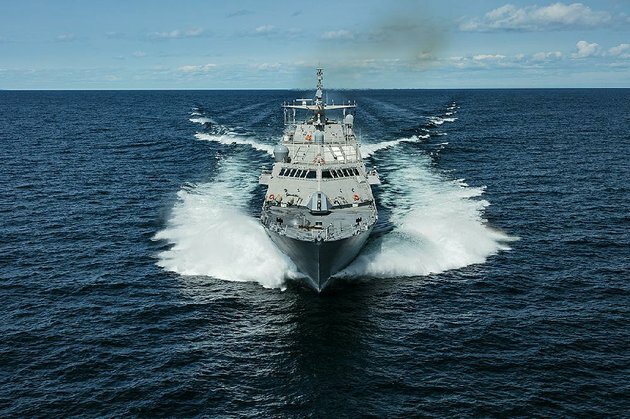 The future USS Little Rock, known as LCS-9, will be the Navy’s 11th littoral combat ship and the fifth of the Freedom variant developed by a team led by Lockheed Martin. The others were built by an Austal USA-led group. The U.S. Department of Defense has awarded contracts for 16 more littoral combat ships to be split by the two companies. Small by the Navy’s standards (389 feet long and 57 feet wide), the class of ships gives the Navy access to thousands of ports unreachable by other ships in the fleet. The vessels’ modular design allows them to be reconfigured for three different missions: surface warfare, mine countermeasures and anti-submarine operations. Shallow-water ships commonly conduct anti-piracy, maritime interdiction and disaster relief missions. The ship, which features a helicopter landing pad on its rear deck, can exceed speeds of 45 knots, or 45 nautical miles per hour. It feeds 1.9 million gallons of water through its four jets every minute, fast enough to fill an Olympic swimming pool in 20 seconds. The future USS Little Rock, which is expected to have a 30-year service life, passed its acceptance trials on Lake Michigan in August, posting the highest score of any Freedom-variant ship to date. From Buffalo, the ship will set sail for its home port in Mayport, Fla., before deploying to sea with a stock crew of 50 sailors, which can double in size depending on the mission package. Once at sea, the ship, with “Little Rock” displayed on the hull, will be many foreigners’ first exposure to the United States, officials said. The ship and its crew — which has already visited Little Rock — will maintain a relationship and connection to the city throughout the ship’s life, officials said. At the commissioning ceremony, the Little Rock city officials will present the crew with a gift from the city. The namesake committee also will give the crew members gifts, Maxwell said. The committee is still determining what the gifts will be, but it’s searching for something emblematic of Little Rock. Officials in Buffalo are planning a week-long celebration for the commissioning, with invitations extended to government officials as high as the White House. Several dozen Arkansas officials and residents are expected to attend the festivities. Once commissioned, the local namesake committee will morph into another standing body to maintain relations with the ship and support the ship’s crew. For example, the committee may decide to fund scholarships for children of crew members, Maxwell said. Former Navy Secretary Ray Mabus is owed much of the thanks for the ship’s name. The former governor of Mississippi spent part of naval service aboard the original USS Little Rock. The Navy accepted the future USS Little Rock (LCS-9) on the 60th anniversary of the desegregation of Little Rock’s Central High School by a group of black students known as the Little Rock Nine. Navy officials said the acceptance date and hull number were coincidental. Shipbuilders began constructing the future USS Little Rock in 2012, but its delivery and commissioning were delayed after some of the initial Freedom class ships experienced mechanical failures and government watchdogs called the littoral combat ship program into question. In mid-2015, the Navy issued three corrective action requests to the Lockheed Martin team, and the U.S. Government Accountability Office asked Congress last year in a report that it “consider not funding” the littoral combat ships requested by the Defense Department in its 2017 budget. However, Lockheed Martin and the Navy say they have sorted out the ships’ problems, and congressional support for the program has remained strong, due in part to the large number of shipbuilding jobs supported by the program. Information for this article was contributed by staff members of Bloomberg News.